I did it. It took me quite some time (like 30-some years) to overcome my personal issue of Mageiricophobia: Preparing a whole fish! I know, I know, they’re not the biggest of their kind, but hey, I dealt with a complete army. Starred at by some dozen pair of eyes, I had to gut them and couldn’t help but think about Barbara’s apposite essay: Meat Comes from Animals: Deal with It, or Eat Vegetables (it has to be one of the longest blog entries I have ever read, start to finish). In the past I would have gracefully declined if I had been offered Anchovies, especially on pizza. Today I’m so-so friends with the overly salty tasting canned version, yet I don’t have to have them on a regular basis – in a sauce that’s a bit of a different story. 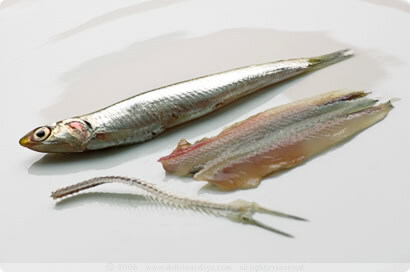 However, fresh and self cured anchovies don’t have much in common with their salty friends. Preserved in olive oil, the tender and juicy filets make a delectable dish. 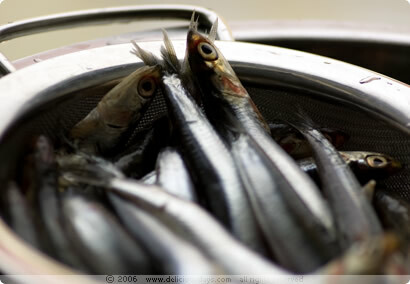 Wash and clean the anchovies. Remove their heads by using your thumb and index finger, then turn the anchovies belly side up and slide your thumb along their backbones and discards the innards. Remove the backbone (with the tail) and the tiny bone, or whatever it is, that’s hiding ‘behind’ the backbone. Rinse briefly and set them aside skin side down on a paper towel. Add anchovies to a flat dish and squeeze the lemon juice with the sherry vinegar over the fish, sprinkle with two to three pinches of salt. Allow to marinate for about 30-40 minutes until the flesh is white and no longer translucent. Very gently rinse the fish one last time, pad dry. Note: Alternatively, you can soak the filets in only sherry vinegar, a mixture of half vinegar and half water or just lemon juice. The vinegar will add more acidity, but also soften any remaining little bones – if you cleaned the anchovies well, no need to worry! 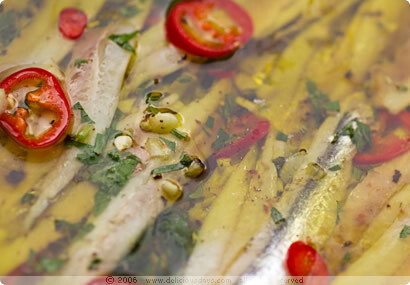 Now layer anchovies in a clean flat dish alternating with chilies, minced garlic, herbs and spices. Add enough olive oil to fully cover the filets, marinate overnight and keep chilled until ready to serve. 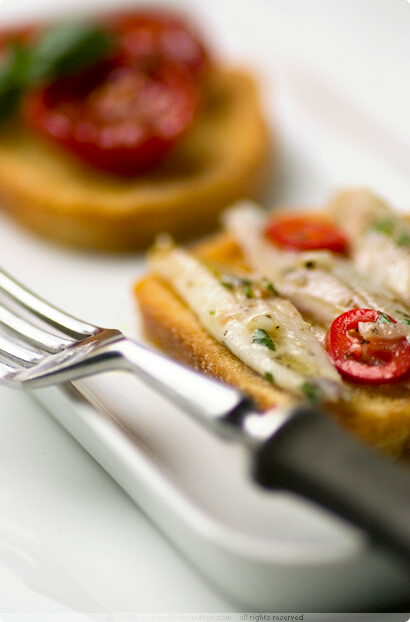 We loved them both as tapa or served on Crostini (on top of a toasted baguette slice). The little delicacies made a perfect cold starter during the current heat wave and they’ll be back on our table within the next week. Btw, I was pretty surprised to find out that it’s not as simple as going to a fishmonger and buy fresh anchovies to prepare Boquerones. The fishmongers I talked to only sell them once or twice a week. We got ours at Poseideon, right next to the Viktualienmarket, where they usually sell the little ones Tuesdays and Fridays. The only time I've had boquerones was in Spain - in friend's home and in several Tapas bars. They are so delicate and oh, so good. You know you are a good food photographer when you can make oily fish look so beautiful! Now, I happen to like oily fish, but I think this would get anyone over their fears! Perfect! Since I've visited Spain, I'm in love with these little fish! Never thought about preparing them myself, thanks for (again!) being an inspiration! i fell in love with sardines and anchovies both on a recent trip to the Dalmatian Coast in Croatia. They prepared them much like these, and I've been wanting to try making them here in New York, but I just haven't found a good source for either tiny fish. This is making me think I should try harder however! Beautiful! I read about your blog in the Chicago Tribune and I'm really glad I checked it out. Will have to try some of your tempting recipes soon! If you visited Spain ask for the tapa named "Boquerones en vinagre" or "Agritos", it's a recipe very similar to yours. Oh, I LOVE boquerones! I've only had them storebought, but I can well imagine how delicious and sweet they might be when prepared like this, from fresh. And I love the addition of chiles. Beautiful, Nicky! They look so delicious! I'm not a big fish eater, but I want to try these :) Thanks for sharing the recipe. Beautiful. This is very nice catch of texture and taste in a few pictures. I love this fish. I will keep this recipe handy! merci. I love them, they´re the best thing ever. Yours look beautiful. I´ve never made my own, as I can have them everywhere. But now I´m tempted! I am sooo impressed. I am a huge fan of boquerones but have never attempted to make them myself. Armed with this recipe, however.... thank you! Your post brought back memories of my last holiday to Spain. Thank you! If I can hunt down some fresh anchovies, I'd love to try your recipe very soon! I am Greek and the daughter of a fishmonger, so I have a tip for you. Buy a bigger quantity. These stay good for up to a forthnight, if you do a bit of a longer prep. You got to cover them in coarse sea salt for 2 hrs, till all their juices come out. Then rinse them well, prepare your marinade and let them stand in the lemon/vinegar, or just lemon or just vinegar in the refrigerator for 24 hrs. Then use any herbs or spices you want, and add sunflower oil till you cover them up. Dont discard the lemon or vinegar marinade. The sunflower oil wont thicken in the low temp of the fridge. Then, when you serve them, just picke them of the container, squeeze fresh juice, and add your olive oil. Wow, hab eure tolle Seite grade entdeckt! Und schon hab ich Hunger! Auch ich hab eine ausgeprägte Abneigung gegen Sardellen, deshalb bin ich sehr neugierig, ob ich mich mit dieser Zubereitungsart anfreunden kann. Oh! Be still my heart, er... tummy! Fantastic as usual! Forget buying them already made, I have just got to make this! I read an old article on nymetro.com and just had to giggle about the part where Mario Batali's ideal meal is to have alici marinate on a slow boat to Amalfi. Such an innocent thing, but oh so delicious! Johanna, Fish in a bathtub, that's hilarious! Maybe some tiny goldfish wouldn't have scared your mum as much - eels remind me more of snakes than actual fish! Josep, Friends of ours just returned from Spain and were raving about your country and its food. It has been too long since we last visited, something tells me that this will change soon! Molly, It's funny, even with the almost unbearable temperatures here in Germany currently, I can't stop adding chiles to almost everything we cook. It added a nice spicy tang to the fish! Very nice pictures and good style for dividing them! 1 Year ago I made 2 kilos of these little delicacy for a catering job. First we tried a few techniques, but we came back to the regular, as of you. I wish our kitchen had looked aproximate like yours after the "battle"! Sherry Vinegar and lemon marination will manageably give the anchovies a good acidic bath, in case you are not using white wine vinegar. Some regions use ginger in the vinegar mixture for marination and it is also sprinkled with chopped hot peppers. Pille, Sadly the word stands for cooking-phobia in general, not only fish - but wouldn't it make sense to have a specific expression just for it ? ;) Anyhow, if you would have lived around the corner, I'd have bravely gutted them and shared some with you! Esther, Thanks for the nice feedback! We're glad ourselves, that we finally gave them a try, they're a definite winner on every tapas plate. your pictures look dorable, thnks for sharing the recipe, too! i have seen these in various bodegas in spain, but never tried them, which i regret now. congrats on the time feature! I tried Boquerones en vinagre in Spain a few weeks ago, and I knew I had to make them myself. It was a taste sensation, the highlight of my holiday! I've been looking for a decent recipe ever since I got back, and now I've found a couple. I'm going straight to the fishmongers! Also, if you like Boguerones, you could try Rollmops, which is a Scandinvian dish quite similar to Boquerones, but made with Herrings! Boquerones are just one more example of how delicious raw fish can be. Have you ever tried cebiche? Or Matjesfilets? These are other great examples. i have a question...i tried this recipe last night and this morning when I looked in the fridge - they weren't white? what could I have done wrong? i used white wine vinegar,salt and a little garlic... could it need more than 8 hours? any advice would be appreciated...thanks so much... luv your blog!